Wagner wrote that in honour of the event he wished to name the new opening (1 f4 f5 2 e4 fxe4 3 Nc3 Nf6 4 g4) the ‘Swiss Gambit’. To test the line, so page 168 of the July 1912 American Chess Bulletin reported, Wagner ‘engaged in 15 correspondence games simultaneously against well-known masters and analysts, with the surprising result that only S.R. 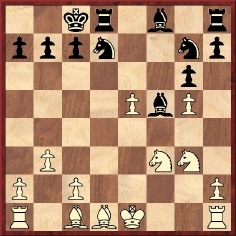 Wolf managed to draw a game, while the 14 other games were partly won by White and are partly pending, much in favor of White’. 1 f4 f5 2 e4 fxe4 3 Nc3 Nf6 4 g4 d5 5 g5 d4 (‘This move proves insufficient.’) 6 gxf6 dxc3 7 fxg7 cxd2+ (‘7…Bxg7 8 dxc3 Qxd1+ 9 Kxd1 e5 or 9…Bg4+ came into consideration.’) 8 Bxd2 Bxg7 9 Qh5+ Kf8 10 O-O-O Qe8 11 Qd5 Bd7 (The Wiener Schachzeitung gave analysis to show that 11…Qc6 would be better.) 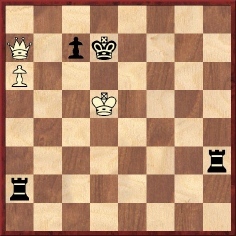 12 Bc4 Nc6 13 Ne2 Nd8 14 Bc3 Bxc3 15 Nxc3 Be6 16 Qe5 Resigns. 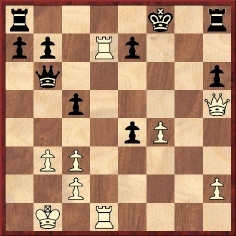 20 Rxe7 Kxe7 21 Qe5+ Qe6 22 Qg7+ Qf7 23 Rd7+ Kxd7 24 Qxf7+ Resigns. 1 f4 f5 2 e4 fxe4 3 Nc3 Nf6 4 g4 d5 5 g5 Bg4 6 Be2 Bxe2 7 Qxe2 d4 8 gxf6 dxc3 9 fxg7 cxd2+ 10 Bxd2 Bxg7 11 Qh5+ Kf8 12 Qf5+ Ke8 13 O-O-O Nc6 14 Bc3 Nd4 15 Qh5+ Kf8 16 Nh3 c5 17 Bxd4 cxd4 18 Ng5 Qe8 19 Ne6+ Kg8 20 Rhg1 Qxh5 21 Rxg7 mate. 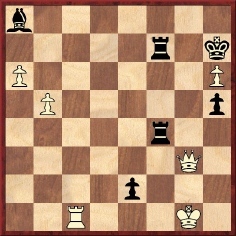 12 dxe5 gxh5 13 Bxh5 Qxh5 14 Nf6+ Kd8 15 Nxh5 Nc6 16 Bd2 Bb4 17 c3 Bf8 18 Bf4 Ne7 19 O-O-O Ng6 20 Rhf1 Be7 21 Ng7 Nf8 22 g6 Resigns. Adolf Albin discussed the gambit on pages 321-324 of the November 1912 Deutsche Schachzeitung, but gave scant variations, viz. 1 f4 f5 2 e4 fxe4 3 d3 exd3 4 Bxd3 Nf6 5 g4 g6 5 g5 Nh5 and 1 f4 f5 2 e4 fxe4 3 Nc3 Nf6 4 g4 g6 5 g5 Nh5 6 d3 d5 7 Be2 Ng7 8 dxe4 dxe4. 28…R8f3 29 Rxf3 exf3 30 Rxf3 Rxf3 31 White resigns. 1 f4 f5 2 e4 fxe4 3 Nc3 Nf6 4 g4 d5 5 g5 Ng8 6 d3 Bf5 7 dxe4 dxe4 8 Qd5 (Duhm calls this a mistake, recommending instead 8 Qxd8+ Kxd8 9 Bg2.) 8…Qxd5 9 Nxd5 Kd8 10 Be3 Nd7 11 a3 e6 12 Nc3 Ne7 13 Nge2 Nd5 14 Nxd5 exd5 15 Nd4 g6 16 Nxf5 gxf5 17 O-O-O c6 18 Bh3 Bc5 19 Bxc5 Nxc5 20 Bxf5 Ke7 21 Rhf1 Raf8 22 Bg4 Ne6 23 Bxe6 Kxe6 ‘with a very favourable endgame for Black’. 1 f4 f5 2 e4 fxe4 3 Nc3 Nf6 4 g4 h6 (Given an exclamation mark by Lenz.) 5 g5 (Duhm said that 5 d3 was not to be recommended because of 5…d5 6 dxe4 Bxg4.) 5…hxg5 6 fxg5 Nh5 (Lenz: ‘…The knight at c3 must take the gambit pawn in order to reach f2 and cope with the threat of …Ng3, on which my entire defensive system was based.’) 7 Nxe4 (According to Duhm, if 7 Bg2 then 7…d5 8 d3 e5 9 Qe2 Nc6 10 dxe4 Nd4 11 Qd3 Bc5, followed by castling, or 7 d3 Ng3 8 Qg4 [8 Bg2 Nxh1 9 Bxe4 d6] 8…Nxh1 9 Qxe4 e6.) 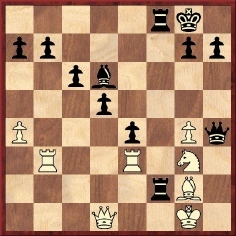 7…d5 8 Nf2 Bf5 (Lenz: ‘From a purely theoretical viewpoint, the opening has been refuted, since Black is developed and has a pawn in the centre and an open rook’s file, while his king is more safely placed than White’s.’) 9 c4 e6 10 Qb3 Bc5 11 Nf3 Ng3 12 hxg3 Bxf2+ 13 Kxf2 Rxh1 14 Nh4 Rxf1+ 15 Kxf1 dxc4 16 Qa4+ Qd7 17 Qxd7+ Nxd7 18 Nxf5 exf5 19 b3 cxb3 20 axb3 Nc5 21 b4 Nb3 22 Rb1 Nxc1 23 Rxc1 Kd7 24 Kf2 Re8 and Black won. 50…Ra4 51 Ke5 Rh5+ 52 Kf6 Rxa6 53 White resigns. 10 Qd3! 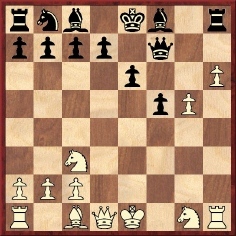 d6 11 Qg6+ Kd7 12 Ngxe2 Qe8 13 Qe4 Kd8 14 g6! Qc6 15 Nd5 Rh5? 16 c4 Qd7 17 Rf1! Rh8 18 Bg5 Nc6 19 Nd4! Ne5 20 Qh4!! Rxh4 21 Rxf8+ Qe8 22 Rxe8+ Kxe8 23 Bxh4 c5! 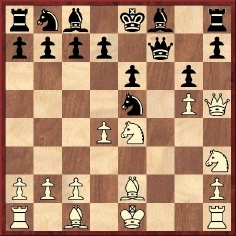 24 Nb5 Nf3+ 25 Kf2 Nxh4 26 Ndc7+ Kf8 27 Nxa8 a6 28 Nab6! Bf5 29 Kg3 Nxg6 30 Rf1 axb5 31 Rxf5+ Ke8 32 Rg5 Kf7 33 Rxg6! Kxg6 34 cxb5 Kf7 35 a4! Resigns. 14…Nxe5 15 Nxe5 Re8 16 Bb2 Bd6 17 O-O Bxe5 18 Bxe5 Rxe5 19 c4 Rd8 20 Bf3 Ne6 21 h4 Nd4 22 Rc1 Re3 23 Kg2 Nxf3 22 Rxf3 Rd2+ 25 Rf2 Bh3+ 26 Kg1 Rxg3+ 27 Kh2 Rg2+ 28 Rxg2 Bxg2 29 White resigns. 1 f4 f5 2 e4 fxe4 3 Nc3 Nf6 3 g4 g6 4 g5 Nh5 6 d3 d5 7 Be2 Ng7 8 dxe4 dxe4 9 Qxd8+ Kxd8 10 Nxe4 Bf5 11 Bd3 Nd7 12 Nf3 Bxe4 13 Bxe4 Nc5 14 Bd5 e6 15 Bc4 Bd6 16 b4 Nd7 17 a3 Rf8 18 Nd4 Bxf4 19 Bxf4 Rxf4 20 Nxe6+ Nxe6 21 Bxe6 Re4+ 22 White resigns. 1 f4 f5 2 e4 fxe4 3 Nc3 Nf6 4 g4 d5 5 g5 Ng4 6 h3 e5 7 hxg4 exf4 8 Nh3 Be7 9 Nxf4 Bxg5 10 d3 Bh4+ 11 Kd2 e3+ 12 Kxe3 d4+ 13 Kd2 dxc3+ 14 bxc3 O-O 15 Qf3 Rxf4 16 Resigns. 1 f4 f5 2 e4 fxe4 3 Nc3 Nf6 4 g4 Nc6 5 g5 Ng8 6 Nxe4 d5 7 Ng3 e5 8 d3 Bd6 9 Qe2 Nge7 10 fxe5 Bxe5 11 Nf3 Bg4 12 Bg2 Qd6 13 Qf2 O-O 14 c3 Nf5 15 Nxf5 Rxf5 16 Rf1 Raf8 17 Qe2 Bxc3+ 18 Resigns. b) 5 g5 Ng4 6 Qxg4 d5 7 Qg3 exf4 8 Qxf4 Bd6. Finally, he mentioned 4…b6, played by Constantin Mandrila in a correspondence game against Julius Wagner Ritter von Jauregg. After 4 g5 Ng8 6 Nxe4 d5 7 Ng3 Mandrila recommended as best 7…g6. a) 1 f4 f5 2 e4 fxe4 3 Qh5+ g6 4 Be2 gxh5 5 Bxh5 mate (‘Let us begin with a joke.’). b) 1 f4 f5 2 e4 fxe4 3 f5 Nf6 4 Be2 h5 (the magazine added an editorial note recommending 4…g6 as stronger) 5 Nh3 d5 6 O-O e6 7 fxe6 Bxe6 8 Ng5 Bg4 9 d3. c) 1 f4 f5 2 e4 fxe4 3 Bc4 Nf6 4 d3 d5 5 Bb3 exd3. d) 1 f4 f5 2 e4 fxe4 3 Nc3 Nf6 4 d3 exd3 (4…d5 5 dxe4 dxe4 6 Qe2 Bf5 7 Qb5+ Bd7 8 Qxb7 Bc6 9 Qb3 or 5…Nxe4 6 Nxe4 dxe4 7 Qh5+ g6 8 Qe5) 5 Bxd3 e6 6 Bd2 Bc5 7 g4 O-O (7…Nh5 8 Nf3; 7…Nd5 8 g5 g6 9 Nxd5 exd5 10 Qe2+ Qe7 11 Qxe7+ Bxe7 12 h4 d6 13 h5 Bf5 14 Bxf5 gxf5 15 Bc3 Rf8 16 O-O-O c6 17 g6 and White stands better) 8 g5 Nd5 (or 8…Ne8 9 Qh5 g6 10 Bxg6 hxg6 11 Qxg6+ Kh8 12 Ne4 Qe7 13 Bc3+ Ng7 14 Qh6+ Kg8 15 Nf6+ with advantage) 9 Qh5 g6 10 Bxg6 Qe7 11 O-O-O hxg6 12 Qg6+ Qg7 13 Qxg7+ Kxg7 14 Nxd5. 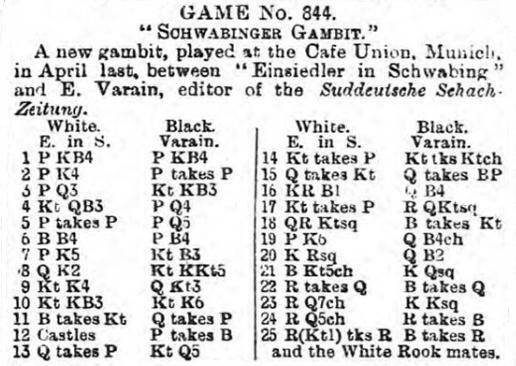 When the Handbuch subsequently referred to the above line it gave 5…d5 as leading to the better game for Black, and it was this that prompted Wagner to turn to 4 g4 instead of 4 d3. The title of his original article (‘A New Gambit. The Swiss Gambit’) was to be misinterpreted, but at no stage did he name 1 f4 f5 2 e4 after Switzerland or claim to have invented those moves. In an identically entitled article on pages 193-194 of its July 1912 issue, the Deutsche Schachzeitung gave the move 4 g4 in bold type, once again indicating that the mere moves 1 f4 f5 2 e4 were not being called the Swiss Gambit. On the other hand, the BCM (March 1912, page 111) implied the opposite, by omission. 35 Nxf5 Rxc1 36 Raxc1+ Kd7 37 e6+ Bxe6 38 Nxd4 Qxg5+ 39 Kf2 Qf4+ 40 Nf3 Bd5 41 Rc3 Bxf3 42 Rxf3 Qxh2+ 43 Kf1 Qh1+ 44 Kf2 Qh4+ 45 Kf1 Kd6 46 Rfe3 Qc4+ 47 Kf2 h5 48 Re4 Qf7+ 49 Kg3 g5 50 Rd1+ Kc5 51 Re5+ Kb4 52 Re4+ Kc5 53 Re5+ Kb4 54 Re4+ Kc3 55 Rde1 h4+ 56 Kg2 h3+ 57 Kg3 Qh5 58 Kf2 h2 59 R1e3+ Drawn. 1 f4 f5 2 e4 fxe4 3 Nc3 Nf6 4 d3 d5 5 dxe4 dxe4 6 Qe2 Nc6 7 Nxe4 Nxe4 8 Qxe4 g6 9 Bb5 Bd7 10 Be3 Bg7 11 O-O-O Qc8 12 Nf3 a6 13 Bxc6 Bxc6 14 Qc4 Bxf3 15 gxf3 b5 16 Qc6+ Kf7 17 Rd7 Re8 18 Rxc7 Qf5 19 Rd1 Rad8 20 Rcd7 Rc8 21 Qe4 Qxe4 22 fxe4 Rc4 23 e5 Rec8 24 Kb1 Rxc2 25 Ra7 R8c6 26 Rc1 Rxc1+ 27 Bxc1 g5 28 f5 Bxe5 29 Bxg5 Bf6 30 h4 h6 31 Bxf6 Kxf6 32 b4 Kxf5 33 Rxe7 Rc4 and Black won. 1 f4 f5 2 e4 fxe4 3 f5 Nf6 4 Be2 h5 5 Nh3 d5 6 O-O Qd6 7 Nf4 Bxf5 8 Nxh5 Bg6 9 Nxf6+ exf6 10 h3 Qg3 11 Bg4 Bc5+ 12 Kh1 Bd6 13 Kg1 Qh2+ 14 Kf2 f5 15 Be2 and Black gave mate in seven. 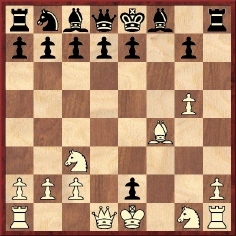 However, our computer offers 15…e3+ 16 Kxe3 Qe5+ and mate in three more moves. 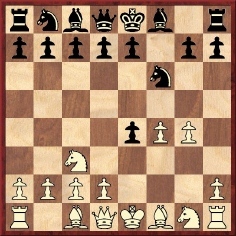 1 f4 f5 2 e4 fxe4 3 d3 exd3 4 Bxd3 Nf6 5 Nf3 e6 6 Ng5 g6 7 h4 Bh6 8 h5 Bxg5 9 fxg5 Nd5 10 hxg6 Qe7 11 Rxh7 Rxh7 12 gxh7 Qb4+ 13 Kf1 Qh4 14 Bg6+ Ke7 15 Qh5 Resigns. 1 f4 f5 2 e4 fxe4 3 d3 exd3 4 Bxd3 Nf6 5 Nf3 e6 6 Nc3 Be7 7 Ne4 Nc6 8 c3 d6 9 Nfg5 Nxe4 10 Nxe4 g6 11 Qe2 e5 12 O-O Bf5 13 Ng5 Bxd3 14 Qxd3 Bxg5 15 fxg5 Qe7 16 Qh3 Qd7 17 Be3 Qxh3 18 gxh3 and White resigned about ten moves later. (Source: Deutsche Schachzeitung, September 1884, page 280.) The magazine observed that the game had historical value, to which Hermann von Gottschall added on page 433 of his monograph on Anderssen, ‘it certainly has no other value’. 43 Qxf4 Rxf4 44 b6 Bf3 45 b7 Rc4 46 Re1 Bxb7 Drawn. 14 Bf4 d6 15 Qe2 Nc6 16 Qg2 Ne7 17 O-O-O Bd7 18 Qxb7 Bc6 19 Qxc7 Bxh1 20 Qxd6 Nc6 21 Nb5 Bxd6 22 Nxd6+ Kf8 23 Nxf7 Kxf7 24 Rd7+ Kg6 25 Rg7+ Kh5 26 h7 e5 27 Bd2 f4 28 g6 Be4 29 Rc7 Kxg6 30 White resigns. This game was given on pages 22-23 of Kornel Havasi and Dr Geza Nagy by W.A. Földeák, published by The Chess Player in 1996. 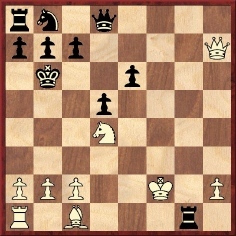 Nowadays, the opening is seen mainly, if at all, in correspondence tourneys, and is invariably labelled ‘the Swiss Gambit’. 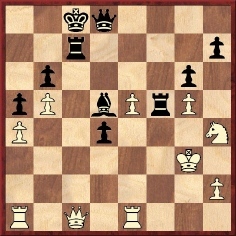 Given that Lange discussed 1 f4 f5 2 e4 half a century before the Swiss appellation was proposed by Wagner (who, in any case, applied it only to the 4 g4 line), it cannot be justified to continue calling 1 f4 f5 2 e4 the Swiss Gambit. 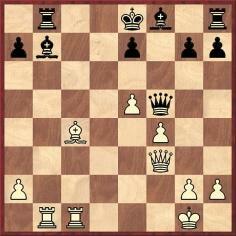 19 e6 Qc5+ 20 Kh1 Qc7 21 Bb5+ Kd8 22 Rxc7 Bxf3 23 Rd7+ Ke8 24 Rd5+ Rxb5 25 Rbxb5 Bxd5 and White mates. Latest update: 1 May 2012.